The adorable Minions – breakout stars from the Despicable Me films. Who would have thought these little yellow creatures would capture the hearts and imaginations of a generation of kids and adults? Their adorable speech patterns and quirky behavior make them the type of characters you wish you could have as a friend in real life! We know your guy wishes you were his minion. While we know that's NEVER the case, maybe you can fulfill his dream just this one time. Surely your BEE-DO BEE-DO siren sounds will get his engine going. 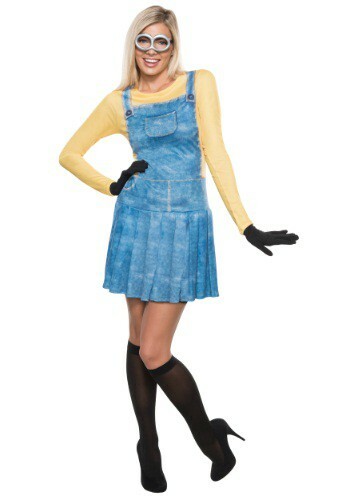 And if you're single and headed to the party, this costume is the perfect way to meet some new Minions. Heck you might even meet the real world Gru and you can start helping him accomplish his world famous crimes. The only way to find out is with this authentic Minion costume! This Minion costume is officially licensed and comes with everything you need to recreate their hilarious look for Halloween. The long sleeve dress fastens with Velcro in the back for a comfortable fit and easy on and off. It is styled to look like denim overalls with a yellow shirt underneath for that classic Minion appeal. This costume also comes with wrist-length gloves and semi-sheer socks for added detail that you won’t find anywhere else. To top it all off, the costume comes with molded vinyl goggles that have an elastic bad around the back for a secure fit. This costume is perfect for a group outing or solo trip to a Halloween party!